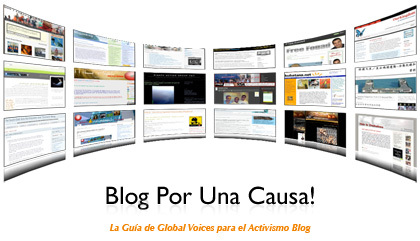 Blog for a Cause!, the Global Voices Guide of Blog Advocacy, is now available in Spanish thanks to this translation by María Florencia Puente from Global voices en Español. Tips to help blog activists stay safe online. Blog Por Una Causa! is availble for download as a PDF file. You may need to install the free Adobe Acrobat Reader to view it. Please download Blog Por Una Causa! and help us translating the guide in your language.